NYATS thank each one of you for attending and making the NYATS Vasantham 2018 Tamil New Year Event held at Hindu Cultural Center on 28th April a huge success and once again proved that teamwork pays off big time!! As you all know, an incredible amount of volunteer time and effort goes into bringing such events to the forefront and we have a long list of people to thank for (hence this long email, please take time to read), right from the initiation to the execution phases of Vasantham 2018, however we apologize for any unintentional omission of volunteer names. We are also very happy to note that there were a lot of newcomers this time helping out in various areas. Our heartfelt thanks and appreciation to them and a request to keep coming back and bring more friends along as well!! We sincerely thank all our members and their families for arriving on time to the event which enabled us to start the event at 3:00pm. !! We all should be really proud of this great achievement !! Our heartfelt thanks to our our well wisher and Event Sponsor Sumathi Sugantharaj New York Life (http://www.sumisugantharaj.com/) for her trust and financial support to NYATS initiatives in 2018. Thank you to all our Business and Individual sponsors for your valuable contributions and continued support to all our endeavors. As always our special thanks to the dedication of all the parents. A huge thanks to all the volunteers for your selfless dedicated hours of contribution towards the event success. We thank our Event sponsors Sumathi Sugantharaj from New York Life for unwavering financial support. We thank all the participants for using our stage to showcase your talent. We thank all the choreographers for your dedication, support and creativity. We thank all our business partners that provided us the needed financial support required for the execution of the program. We thank HCC for providing us the venue and facilities to host the event. We thank the entire dedicated 15 member NYATS Committee for your time and support without which event of this magnitude could not have been possible. We like to thank our Board of Advisors (Aadhi, Kailash& Jayashree) for your continued contribution. We like to thank our outgoing 2016-2018 Executive Committee (JP, Ragavan and Richard) and 2016-2018 committee members for their 2 years of hard work and dedication to the Tamil Sangam. We thank Sathiya Palanivel, Maha Ramasamy, Shilpa Narashimman, Varsha Jayaprakash, Shreya Mahesh for doing the MC role and holding the fort like pros. We thank Sujatha Rishi for helping with the stage curtain. We sincerely would like to thank those groups who made an effort to accommodate innovation in their event. We thank Sudarshan, Ragavan for helping in the flyer and brochure design respectively. We thank Elango in printing the flyer and brochure. We thank Cultural leads Elango, Anusha, Balamurugan, Sudarshan for the end to end management of cultural programs. We thank our stage decoration lead Radhika JP, Richard & Gajendran. We also thank JP, Jayashree, Kavitha Gajendran, Sathya Palanivel, Vasantha, Maha, Kodi for volunteering in the Stage decoration. We thank Tom for providing excellent audio throughout the event. We thank Balamurugan, Richard, Kodi and Mahesh Nattanmai for creating a nice lively and interactive slides !! They were really innovative. We thank the efforts of our marketing team lead by Mahesh, Madan, Kodi supported by Elango, JP, Narashimman and Balakrishnan. Thank you all !! You are our real vasool Rajakkal !! We thank Chockalingam, Narashimman for their membership, front desk activities. We thank Shalini Raman, Mala Ramakrishnan, Vasanthi Jayakumar and Selvi Sivakumaran for helping in the front desk. We thank Madan Sundararaju for picking up the Jasmine flowers from the store in NJ !! We thank Ganesh for leading Thiruvizha setup committee and we thank Ravi Meyyan, Gopi, Saravanan for volunteering in making Popcorn, we thank Rudraskandan (Rudy), Subbu on Cotton candy stalls. We thank Balamurugan for setting up the machines and stalls. These two items are always a highlight among kids !! We thank Narashimman for the countless shopping trips made before and during the event for the Groceries !! We thank Ragavan, Sharanya for taking innumerable pictures of the event and people !! We thank Ganesh for capturing all the events in video !! We thank Jagan for leading the food committee which is one of the very important and laborious task. We would like to thank the following Cooking team lead. Gajendran (Mango Coconut konda kadalai Sundal, Masala Vadai, Kaara Chutney), Velan, Suresh Dhanapal(Tea), Govind (Cilantro Coconut Chutney), Kalpana Jagan (Curd Rice, Thayir Pachchadi), Arun Krishnan (Pulav), Rudy (More Milagai), Vasanthi (Sambar), Meena (Pineapple Kesari). We thank the following volunteers for providing the Idli Batter: Maha Ramasamy, Sathiya Palanivel, Menaka Vijayaraj, Suresh Dhanapal, Ganesh, Shilpa Narashimman Elangovan, Mahesh, Jagan, kavitha Sivakumar, Sasikala, Nithya Kailash, Senthu Mohan. We thank Gajendran for making that tasty Ven Pongal breakfast for all the volunteers on 28th April morning. We thank the following volunteers for helping with cutting vegetables and during cooking: Subramanian Krishnan, Renuka Rajkumar, Sivakami Thyagarajan, Sathya Palanivel, Mahesh, Kaushalya, Priya krishnakumar, Laskshmi Mahesh, Balamurugan, Janakiraman, Prakash Raj, Ragavan, Glad son and wife, Balaji, Lavanya Balaji, Jayasree Ganesh, Velan, Chockalingam, JP, Elangovan, Balki, Raja Perumalswamy, Richard, Shenbahasan, Kannan Narasimhan, Monica Ramesh, Meena Rajan, Mohammed Azad, Vasanth Chellappan, Sasikala Ganesh, Vasanthi, Jayakumar, Suganthi Magesh, Nitya Kailash, Senthu Mohan, Sivakumaran Appanah, Govindraj kesavan, Madan, Palanivel Balasubramanian, Preetham. We thank all the non-committee food serving volunteers for lending timely support to our food serving committee lead during snack and dinner sessions. We thank Sara & Venu’s son Prasanna for helping with food transfer to the basement and serving the food. Several youngsters from our community helped during the event. !! Awesome job kids. Thanks to all other volunteers who are not mentioned here but helped us towards the success of the event. Thank you to all those from the Cleaning Team who stayed back to help clean the HCC basement, auditorium, dining hall, makeup-rooms etc. It is the most difficult and tiring task to do after a hectic day and our sincere thanks and appreciation to you all. We apologize for any inconvenience caused during the event which was beyond our control. Your feedback and comments are always welcome. We have already received several positive feedback about our program from some members and we sincerely appreciate it. However we are willing to improve and hence we would like hear your feedback for better events in the future, please send them to nyalbanytamilsangam@gmail.com. We will strive to work together and get better. Last but not the least, Thank you for being a great audience and offering your trust and support all the way! With the new Executive Committee and other Committee members on board, NYATS is all set to reach the next level and we request your continued support to help us do so. Once again, NYATS 2018 team, wishes you a wonderful year. Please click the Gallery button below to view the wonderful moments of Vasantham 2018. 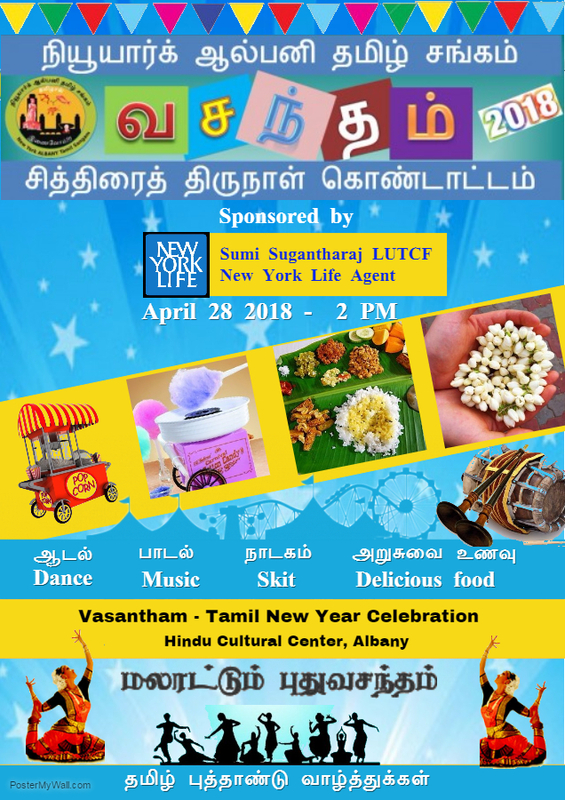 NY Albany Tamil Sangam invites you all to join us for our தமிழ புத்தாண்டு கொண்டாட்டம் !!! – Tamizhar Puthaandu Kondattam!!! As always, your participation is very important to make this a successful event. See below for more details on the cultural program guidelines. Please use the Registration form link in program guidelines to enroll your performance before Sunday, April 8th 2018. All Programs should be in Tamil. Choreographers and all participants should be members of NYATS. Choreographers have to confirm this with all the participants and report on the same to the cultural leads. All participants should join or renew their Tamil Sangam membership on the day of rehearsal, if they have not registered as members for 2018. Programs will be accepted on a first come first serve basis. All participants should be present for the rehearsal, even if they can’t perform that day. Tamil New Year centric programs and Programs showcasing Tamil culture will be given priority. Please try to make your performances Innovative/Creative. Participants will be restricted to a maximum of 2 performances. Medley should be restricted to a maximum of 3 Songs. Duplicate entries in Medley will be requested to be replaced. Choreographers should clearly state the details of all Song(s) and Movie(s) names. Ambiguous entries and duplicate items will not be accepted. Performances should not exceed a maximum of 6 minutes with minimum of 3 participants. Play/Skit should not exceed maximum of 10 minutes. Use the Form below to register your event. The deadline for Choreographers to register your performance will be Sunday, April 8th 2018. Any and all decision concerning the program will be made by the cultural leads and will be deemed final. Event order will be released only on the day of the Program. Participants will be seated in order of their program. Participants are kindly requested to stay till the end of the program to encourage other participants.